The 49th annual PDK Poll of the Public’s Attitudes Toward the Public Schools was released recently, and once again showed the importance of career preparation in K-12 for American students. Respondents overwhelmingly supported the idea that students need classes devoted to preparing them for the real world, including training for specific careers and training on employability and interpersonal skills. Over 80 percent indicated that they would prefer career and jobs preparation courses even if it meant students spending less time in academic courses. Fewer than half of public school parents (47 percent) expect their child to enroll in a four-year college full time. Other parents expected their child to enroll in two-year colleges or vocational programs, while others expect their students will enroll in postsecondary training part-time while also working. These findings indicate that parents are thinking deliberately and strategically about their students’ futures in the real world. A new report from the Georgetown University Center on Education and the Workforce, in collaboration with JPMorgan Chase & Co. details the 30 million “good” jobs available in the US for workers without Bachelor’s degrees. These jobs pay a median wage of $55,000 annually, and are largely found in the manufacturing and skilled-services industries. The research also points out that even though there is a wide public perception that there are no jobs available for those without Bachelor’s degrees, workers without them still comprise 64 percent of all workers. However, this does not mean that workers do not require any postsecondary training. 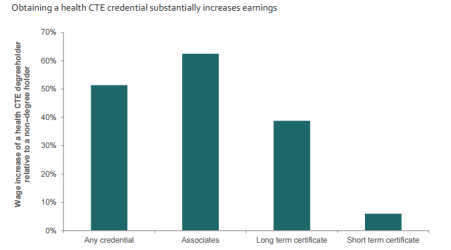 Increasingly, jobs are requiring Associate’s degrees or other postsecondary credentials, so future job seekers should still plan on attaining some level of postsecondary experience. The Education Commission of the States recently put together a comprehensive summary of state policy actions taken related to high-quality computer science education. These actions include adopting statewide computer science standards and creating banks of high quality resources for educators to use. The Georgetown University Center on Education and the Workforce also recently released a report detailing the effects of the current healthcare debate on the nursing profession. The report finds that a college education is increasingly important to be successful in nursing, and also finds that lack of diversity remains a challenge for the field.